MOQC’s Steering Committee is composed of physicians and non-physicians representing a variety of oncology practices by type and size of practice from across the state of Michigan. Members voluntarily provide input, critical feedback and decision making to the Coordinating Center team on all aspects of short and long term issues that are presented to the Consortium. The commitment of this group of professionals is a two-year term, beginning in early Spring of each year. 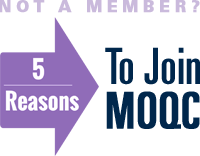 The nomination process opens at the January biannual meeting every year and is available to all MOQC physicians and practice members. Members participate every other month in 30-minute teleconferences and also two meetings scheduled in conjunction with each biannual meeting in January and June. The rest of the work is done via email. MOQC’s Steering Committee is supported by a Measures Group, which is a subset of members dedicated to working with the Coordinating Center team on selecting relevant and meaningful measures for trending and abstraction across MOQC practices. The Measures Group conducts their work on a monthly basis via teleconference over established time periods of time (e.g. around abstraction periods). The Steering Committee and Measures groups receive input and advice from its newly formed Patient Advisory Group (PAG), starting Spring, 2017.